Toledo Integrated Systems has been providing Allen Bradley solutions to the metal forming industry for over 13 years. In that time we have worked with all of the Allen Bradley hardware platforms including PLC5, SLC, MicroLogix, CompactLogix and ControlLogix. Our AB Maximizer TPC has many standard control and automation features but allows for easy customization and expandability. The Max TPC is built to order with all the functionality and integration that the customer requires. 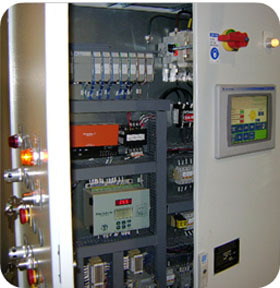 This gives the customer complete control of the equipment using standard "off-the-shelf" hardware. The HMI is also selectable. Along with the standard Allen Bradley offerings for the HMI, we are capable of providing an industrial PC or a screen from a different vendor (if you have standardized on a certain screen). Below is a list of the standard features and options for the AB Max TPC. The options don't stop there. 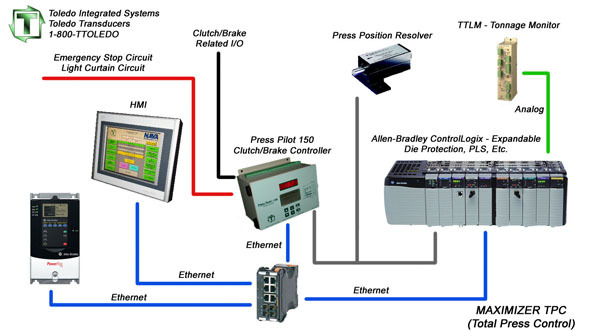 The true advantage with a PLC system is that it can be expanded and customized to the customer's exact needs. All supplied controls comply with OSHA, ANSI and CSA Z142-02 regulations for mechanical stamping presses. Project: Provide AB Maximizer TPC packages for four (4) 30-Ton Oak Presses. Scope: Design, panel build, program and commission press controls using Allen-Bradley CompactLogix PLC, Press Pilot 150 and PanelView Plus 1000 HMI's. Design Considerations: All devices to communicate over Ethernet including the main motor drive (AB PowerFlex). Provide servo feed interface with a Vamco feeder. Press to run at a maximum of 1000 SPM. High speed linearization for Top-stop speed compensation. Oak standard "slide lift system"
Project: Provide AB Maximizer TPC package for a 1200-Ton Verson Press. Scope: Design, panel build, program, turn-key installation and commission press control using Allen Bradley SLC 5/04, Press Pilot 100 and 15" Industrial PC HMI. Add interlocks for a new HMS transfer system. Design Considerations: Use DeviceNet for remote junction boxes to reduce installation wiring. Reuse main motor eddy current controller and all starters. Provide serial interface with the dynamatic eddy current controller for SPM control.